The twenty-first century is witnessing a change in the global political architecture where the balance of power is shifting from the west to the east. With this systemic change, the two most dominant players that are emerging strong in the international arena are- India and China. The two most populous nations and Asian civilizational powers, which are estimated to become the largest economies of the world by 2050 are increasingly rising by asserting their global profiles. In this strategic shift of power, it is in all likelihood that the twenty-first century as mostly debated will be the 'Asian Century'. 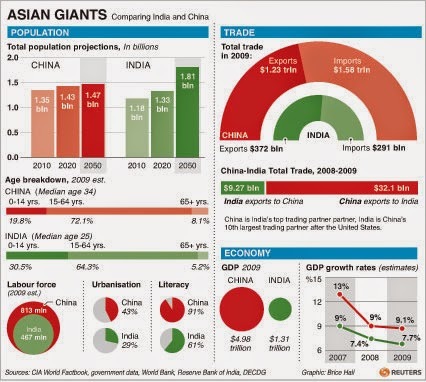 Whereby, the contours of this Asian century will be mainly drawn by the behavioral dynamics of India and China. And most importantly, by the bilateral relationship between the two long standing Asian powers which is observed to be the most important relationship of the present times having an impact on the discourse of future global politics. According to the United States National Intelligence Council Report titled ―Mapping the Global Future by 2020, the global architecture will envision- ―[t]he likely emergence of China and India as new major global players - similar to Germany in the 19th century and the United States in the early 20th century – will transform the geopolitical landscape, with impacts potentially as dramatic as those of the previous two centuries. In the same way as commentators refer to the 1900s as the ―American Century, the early 21st century may be seen as the time when some in the developing world, led by China and India, come into their own. With this assessment, it leaves no doubt that emerging India and China will draft the future trajectory of global politics. As rising global powers, both India and China have committed themselves to promote peace, stability and development in the current international system. Having significant implications, the bilateral relationship has captured world wide attention whereby the global apprehension lies in understanding the manner in which the credible partnership between India and China will nurture and sustain in order to serve mutual benefits and bolster global aspirations. In this view, Chinese Premier Wen Jiabao in one of his meetings with the Indian Prime Minister Manmohan Singh, is reported to have remarked: ―When we shake hands, the whole world will be watching. In this context, it becomes imperative to understand the changing dynamics of India‘s policy towards its eastern neighbor China. From the dominant perspective, it is clear that India‘s foreign policy towards China over the years have lacked coherence in terms of having a definite vision. It has predominantly been shaped by short term goals without any strategic approach and has been implicated by domestic political constraints and a limited lens of mutual distrust which has gravely curtailed the potential of the relationship. Having this view, with the current shifts in the balance of power as complemented by a 'China Rise' it becomes imperative for India to diversify its foreign policy objectives towards China in order to maximize the payoffs which is deemed to have significant implications on the relationship as a whole. In this view, understanding the systemic realities,India‘s foreign policy towards China is seen to have changed from conforming to the existing continuities to that of changing the course of diplomatic choices. The change is noted in terms of adopting a political vision over the longstanding factors of bureaucratic expertise and military demands. With a common interest to rebuild the relations, both India and China have succeeded in laying a constructive path of development beyond the shadow of the past. Premised on an increased high-level interaction and multilateral engagements, India and China have opened new chapter in their relations owing to a common vision of peace and prosperity. Of which, the most important landmark has been set by the "Modi-Xi' cordials- which has changed the relational dynamics, whereby, engagement has become the command of politics. With this strategic shift, India‘s foreign policy towards China has taken a new path as the longstanding dilemmas are now being transformed with a proactive policy framework. In this positive atmospheric, it is important for India to redefine its relationship with China, which will shape the contours of its future foreign policy. Having a proactive approach with a long term measured foreign policy will fetch greater payoffs for the bilateral relations between the two countries, who are the dominant players of the twenty-first century.Therefore, it is imperative for India to shift its China policy from the rubrics of the dogmatic security dilemma to that of pragmatic proactive engagement. India‘s foreign policy has traditionally been guided by the theorem of ―three concentric circles.The first circle, which encompasses the immediate neighborhood, India has sought primacy and a veto over the actions of outside powers. For example, India‘s big brother policy in South Asia, where the balance of power is dominated by India. In the second, which encompasses the so-called extended neighborhood stretching across Asia and the Indian Ocean littoral, India has sought to balance the influence of other powers and prevent them from undercutting its interests. For example, India‘s 'Look East Policy', which is now mainly aimed at balancing China. In the third concentric, which includes the entire global stage, India has tried to take its place as one of the great powers, a key player in international peace and security. This can be understood in terms of India‘s role in various multilateral institutions such as the United Nations, SAARC, BRICS, BISA, SCO and others. Following these three thumb rules, India‘s grand strategy adopted a restricted approach which historically prevented it from realizing the strategic goals in an absolute manner. Hence, with the end of the Cold War, India‘s foreign policy had to undergo a reinvention in order to meet the strategic shifts in the international system as witnessed in making a way to economic liberalization from state socialism, to that of shifting its strategic focus beyond its immediate neighbors and engaging with them and most importantly, facing a rising China. Thereby, India drifted from its isolationist policy of Non-Alignment and took the road of a pragmatic policy of engagement. Therefore, India‘s foreign policy has taken a more proactive posture from its long standing passivity. In acknowledging this significant shift, C. Raja Mohan states that, ―After more than a half century of false starts and unrealized potential, India is now emerging as the swing state in the global balance of power. In the coming years, it will have an opportunity to shape outcomes on the most critical issues of the twenty-first century: the construction of Asian stability, the political modernization of the greater Middle East, and the management of globalization. Hence, what India‘s policy needs to adopt is an active posture in order to elevate its global profile as a dominant player in the international stage. 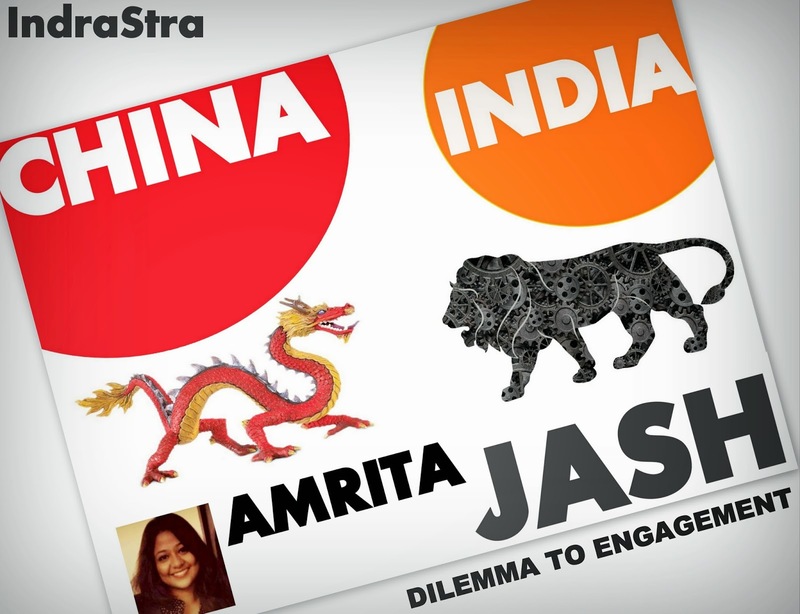 India‘s China policy has undergone dramatic changes over the six decades of diplomatic relations. As over the years it has been shaped by the complex inter plays of various factors, such as- historical ties, geographical proximity, experiences of the past and present needs, varying perceptions of the political elites and their ideological standpoint. In addition, to these critical factors are the influences from the international forces in terms of the changing balance of power in the international system as well as the regional power nexus. Thereby, these parameters act as the drivers behind the national interests that frame India‘s China Policy. In this view, despite being India‘s biggest neighbor, China has predominantly received only episodic attention from the Indian government and its people. India‘s China policy has mainly been rooted in suspicion and miss-perception, unable to adopt a strategic view. That is, India‘s China policy lacked a competent and visionary political direction. This can be assessed from the eventual growth of the relationship. 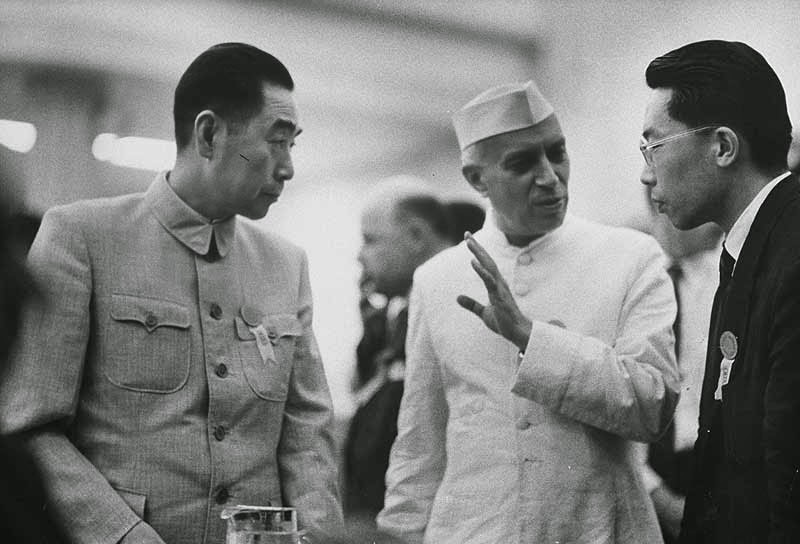 India and China established their diplomatic relations on April 1, 1950. India was the first non-socialist country to recognize the People‘s Republic of China (PRC) and since then the relationship has evolved over the years with the periodic ups and downs. v In the initial years from 1950-1958, India-China relations is said to have been in the 'honeymoon phase', where the relationship was defined by the slogan 'Hindi-Chini Bhai Bhai'. In 1954, both India and China gave a legal foundation to their new nation-to-nation relations with 'Panchsheel' as the framework for relations between the two countries. Whereby, the Indian Prime Minister Jawaharlal Nehru and Chinese Premier Zhou Enlai exchanged visits and jointly put forth the famous ―Five Principles of Peaceful Coexistence to live and prosper together in peace and harmony. India-China diplomatic relations witnessed a severe low in 1959 with the Tibetan uprising and the flight of Dalai Lama to India. This led to a distrust in the relations resulting into territorial tensions of sovereignty over the McMahon Line. In 1962, the territorial tensions escalated into a border war- in which the two neighbours fought along the eastern and western sectors of their Himalayan border, thereby, culminating into a deadlock in the diplomatic ties. In 1976, the relations were gradually restored with then Indian External Affairs Minister, Atal Bihari Vajpayee‘s path breaking visit to China, which led the foundation for the renewal of contacts at the highest political level after a gap of two decades. In 1988, Indian Prime Minister Rajiv Gandhi‘s pragmatic visit to China, marked the landmark in the renewal process of the 26 years of frozen bilateral ties, activated by hostility and armed tension. This event brought a major turning point in India-China relations, as they entered into a ―new beginning aimed at an overall restoration and development of the relations. In this light of a gradually improved India-China relations, a minor setback in the ties was brought with India‘s 1998 nuclear tests- as it was justified by references to the 'Chinese threat'. With the coming of the twenty-first century, India-China, witnessed a new high with rapid development in the relations and embarking into a ―Strategic and Cooperative Partnership in 2005, thereby, getting the 'trust factor' back in the relationship. With these rise and fall of events, India‘s relations with its East Asian neighbor- China has evolved over the years in the continuum of friendship, enmity, rivalry and engagement. 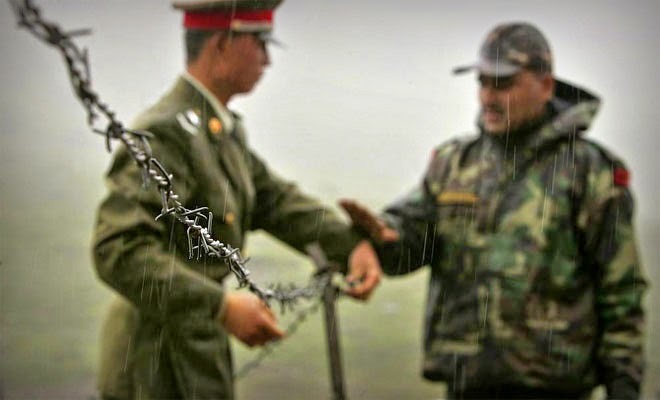 With the resurgence of the diplomatic ties, both India and China have crafted a durable framework to manage their border dispute and cooperate in areas of mutual interest within the confines of a cold peace -thereby, building a greater political and economic engagement between the two countries. 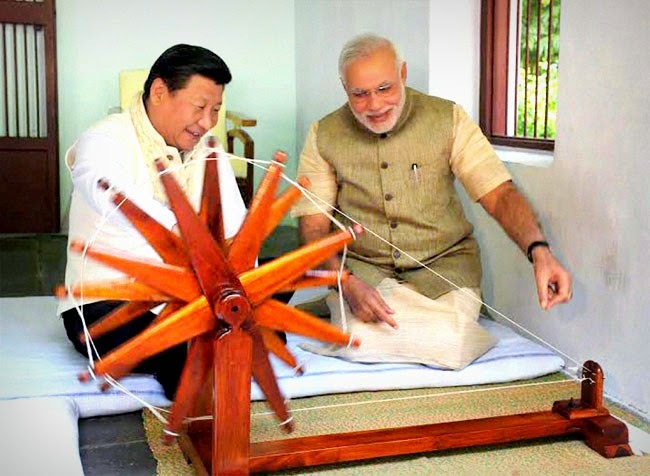 Thus, evaluating the growth of India-China relations, it can be assessed as Alka Acharya states: ―There is little doubt that India and China are moving on the path of normalization of relations – albeit, not quite with fluidity and ease. At best they have acquired a fair degree of political comfort, at worst, they are merely conflict-free, though suspicion-prone. 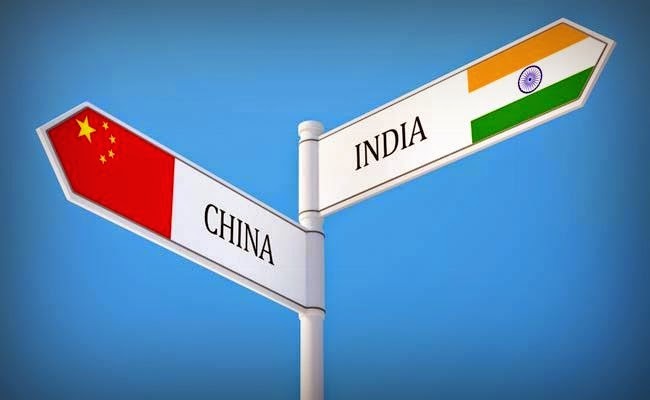 In an overall assessment, it can be said that the current phase of India‘s China policy is embroiled in the ―contradiction of the 'push' and 'pull' factors- …. [which is regulated by the] - 'pulling together' [of] economic trade and cooperation on the one hand and persisting 'pushing apart' by high levels of political mistrust and suspicion on the other. In the current dynamics, India‘s foreign policy towards China has paved a new path. This has been oriented by the change of political leadership in India in May 2014. This political transition has given a new dynamism to India‘s relations with China, with an added Chinese interest to earnestly engage with the newly formed Narendra Modi Government. Chinese Foreign Minister Wang Yi‘s two-day high-level visit to New Delhi on June 8-9 as President Xi Jinping‘s special envoy is indicative of China‘s proactive engagement with the new government. India‘s proactive diplomacy towards China is witnessed in terms of India‘s departure from its erstwhile dogmatic position and reaching out to befriend China, negating the less accommodating posture towards Beijing. 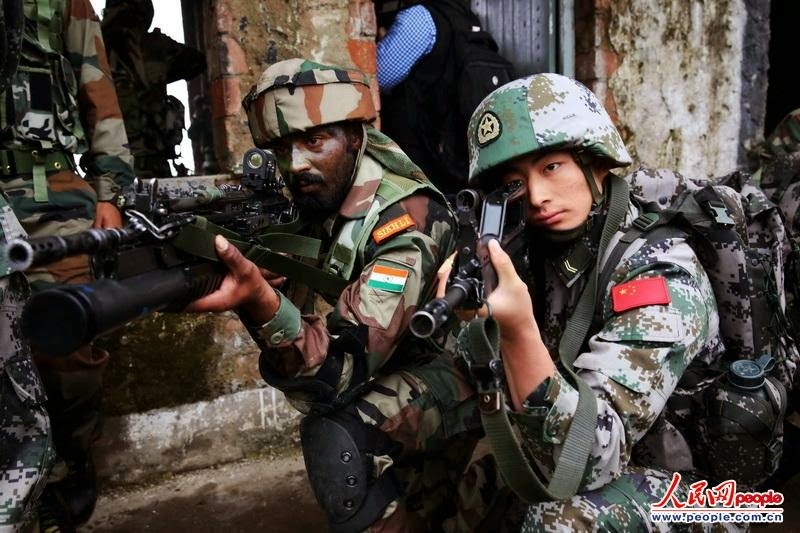 Here, India‘s China policy focuses on greater engagement than restrictions. The most important landmark to this proactive engagement has been brought by Chinese President Xi Jinping‘s maiden visit to India from 17-19 September 2014. The historic Modi-Xi interaction opened a new chapter in the India-China relations of the twenty-first century as witnessed in Indian Prime Minister Rajiv Gandhi‘s iconic visit to China in 1988- setting the threshold of a new beginning. India‘s departure from a reactive foreign policy is visible in the way the diplomatic interaction emerged above the situational complexities of military stand-off at the Chumar and Demchok sectors of Ladakh along the Line of Actual Control (LAC), which failed to pose a deadlock to the bonhomie. Rather politics and economics were met with pragmatism. The new spirit of reviving the friendship from the vestiges of the past deadlocks is clearly outlined in the Joint Statement as issued by India and China over Xi Jinping‘s visit, which strongly stated that:―[A]s two large developing and emerging economies, their developmental goals are interlinked and should be pursued in a mutually supportive manner. Recognizing that their respective growth processes are mutually reinforcing, they agreed to leverage mutual complementary and build a closer developmental partnership. The leaders agreed to make this developmental partnership a core component of the Strategic and Cooperative Partnership for Peace and Prosperity. This developmental partnership is conducive not only to the common interests of both sides, but also to stability and prosperity of the region and the world. The significance of this high-level interaction can be understood in terms of the greater 'opening up' between India and China both economically, politically and socially.x This is clearly reflected in the signing of 16 significant agreements. Of which, the most important is that of China‘s investment of 20 billion USD in India over the next five years in infrastructure and manufacturing sectors, setting up of two industrial parks and to upgrade India‘s railway system with high-speed links and assigning of ―Strategic Economic Dialogue‖ to further the economic cooperation in areas of energy, environment, urbanization and others. There is also a regional dynamic, where the emphasis have been laid on establishing a provincial partnership between Gujarat and Guangdong Province and Sister-City relationships between Mumbai-Shanghai and Ahmedabad-Guangzhou. While on the border issue, both sides maintained the consensus of upholding the sanctity of the 2005 Agreement on the Political Parameters and Guiding Principles for the Settlement of the Boundary Question. As the Joint Statement posited: ―Peace and tranquility on the India-China border areas [is] as an important guarantor for the development and continued growth of bilateral relations. Pending a final resolution of the boundary question, the two sides would continue to make joint efforts to maintain peace and tranquility in the border areas. In the social sphere, both parties have proposed to widen the engagement of people-to-people contact and art and cultural exchanges (Buddhist Art, language, social media-movies, television and others) and most importantly, opening up a new route to ―Kailash Manasarovar FPRC Journal 2015 (1) India’s neighborhood policy-post 2014 129 Yatra (for pilgrimage from both sides), through the Nathula Pass in the Indain state of Sikkim. And at the global level, the leaders affirmed cooperation on ―zero tolerance to terrorism‖ to that of integration in space technology, cooperation in civil nuclear energy and above all, a shared interest to play vital roles- India in SCO and China in SAARC. Therefore, from the above reflections it is clear that India‘s new China policy focuses on greater engagement with China, exhibiting a departure from the dilemmas of the past. As after a long era of ad-hoc, reactive, weak-kneed diplomacy, this new clarity and vision represent a welcome change for India, where pragmatism has become the hallmark of diplomacy. The iconic high-level interaction between the leadership of both sides has opened a new phase where cooperation over tension has taken the command in politics and diplomacy. And that India‘s China policy has risen above the proxies of bureaucrats and military, advancing a new line of thinking. India‘s foreign policy towards China needs to adopt a sustainable and effective framework which goes beyond the issues of physical security and rather takes into perspective the political interests which has a binding on the economic and social growth of the bilateral relationship. This can be done by tapping the potential of commonalities between the two countries. That is, they can converge as- both are growing economies, a large section of their populations have poor living conditions and they are similar in regard to labour standards, issues of food security, migration, energy security, commodity prices, climate change, World Trade Organization (W.T.O) negotiations and others. Owing to these common interests, the political elites of both India and China would find more grounds for cooperation. In this regard, in terms of high-level political and economic interaction, India‘s China policy should encourage greater engagement in terms of calibrating the US factor in the relationship, cooperating in sub-regional level and in areas of non-traditional security concerns, developing nonrenewable energy resources, and adopting a comprehensive interdependence. Apart from these objectives, India‘s China policy should also largely emphasize on people to-people contact by means of scholarly exchanges, cultural exchanges, educational exchanges, funding of academic researches and contributions to joint military exercises. All these factors would act as strong confidence building measures and thereby, narrow down the differences that limit the holistic growth of the bilateral relations. Given the strategic shifts in the international domain, it is not pragmatic for India to adopt a confrontational posture towards China in achieving its global aspirations. Rather India needs an institutionalized configuration to deepen its relationship with China in a constructive, credible and sustainable way. The policy towards China should adopt a multidimensional framework rather than perceiving it through the unidirectional lens of competitive rivalry. Thereby, for India the best policy choice towards China needs a proactive diplomacy based on pragmatic engagement rather than disengagement, making it a global partnership of the twenty-first century. That is to say, India‘s China policy needs to adopt a comprehensive, long term framework bestowed with a concrete strategic vision. i. ―Globalization and Future Architectures: Mapping the Global Future Project 2020, Report of a Conference on 6 June 2005, Chatham House London, pp. 13, https://www.chathamhouse.org/sites/files/chathamhouse/p ublic/Research/International%20Security/r2020.pdf (Accessed October 7, 2014). ii. Quoted in Harsh Pant, ―Indian Foreign Policy and China‖, Strategic Analysis, Vol. 30, No. 4, October-December 2006, p. 761.
iii. C. Raja Mohan, ―India and the Balance of Power‖, Foreign Affairs, Vol. 85, No. 4, July/August 2006, pp. 17.
vi. The ―Five Principles of Co-existence‖ are- (i) Mutual respect for each other‘s territorial integrity and sovereignty, (ii) Mutual non-aggression, (iii) Mutual non-interference, (iv) Equality and mutual benefit and, (v) Peaceful co-existence. viii. Alka Acharya, China and India: Politics of Incremental Engagement, Har-Anand Publications, New Delhi, 2008, pp. 161.
ix. ―Joint Statement between the Republic of India and the People‘s Republic of China on Building a Closer Developmental Partnership‖, Ministry of External Affairs, Government of India, September 19, 2014, http://www.mea.gov.in/bilateraldocuments.htm?dtl/24022/J oint+Statement+between+the+Republic+of+India+and+the+Pe oples+Republic+of+China+on+Building+a+Closer+Developmen tal+Partnership (Accessed October 7, 2014). xi. Brahma Chellaney, ―Narendra Modi‘s Imprint on Foreign Policy‖, Live Mint, September 2, 2014, http://www.livemint.com/Opinion/Rx9Waq6uNG6yHJaSJMu rTL/Narendra-Modis-imprint-on-foreign policy.html (Accessed October 7, 2014). xii. See Jabin T. Jacob, ―India‘s China Policy: Time to Overcome Political Drift‖, RSIS Paper, June 2012, pp. 5-7.